This new and unique stitch will enable you to make complete objects such as blankets or clothing, as well as being a beautiful accent or edging for use on crocheted items made using other stitches and patterns. Like real tulips, which occur in pretty much every colour, the bloom can be made in any combination of two colours, but works equally well when made in monochrome. Please follow the provided instructions to make this lovely and delicate tulip pattern. Tulip Flower Stitch – Free Crochet Pattern is here. Don’t forget to Like us on Facebook. Share your ideas and your work on our Facebook group! 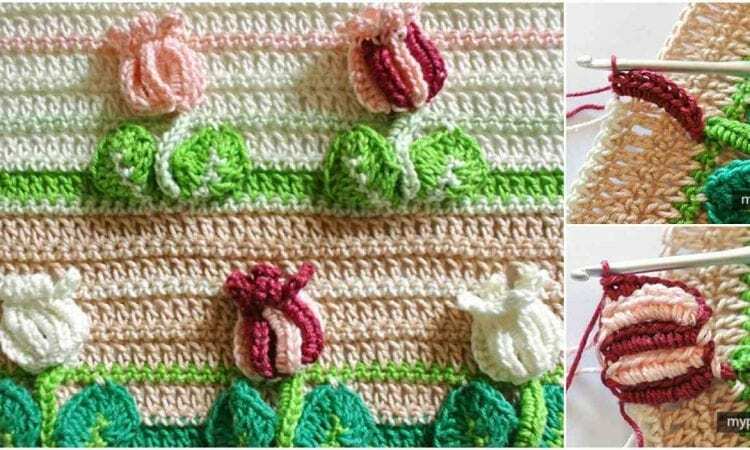 the tulip flower stitch pattern is very pretty!